(Yawn) We sure did a lot. We made some new friends, went to that new amusement park, fought the big bad and won, we laughed together, we cried together, and learned a whole lot about ourselves. Boy, are we tired. So how are we going to end this story / episode / season / series / movie? Well, there is one way. Let's put on our jammies and hit the sack. This trope can happen even when the situation is not happening at night. A common ending in some children's books and shows, where they end the story with the characters going to bed. Always a perfect ending for an Insomnia Episode, a "Getting Ready for Bed" Plot, or one when it was All Just a Dream (as long as they end it by going back to sleep). WARNING! Examples may contain spoilers. Read at your own risk! Episode 12 ends with Chiyo Chan going to bed. Which is fitting because the whole episode involves her going about her school day; beginning with her waking up. After Mayaa reunites with Sakaki in episode 24, Chiyo Chan lets the two sleep over for the night at her house. Subverted in chapter 22. After working things out with their neighbors so they won't be so loud, Kobayashi, Tohru, and Kanna decide to lay down and take a nap. It would have been peaceful if Tohru didn't grind her teeth as she slept. Poor Kobayashi. Played straight in episode 1 of the anime, where Kobayashi and Tohru lie down for the night (though Tohru does have a short Flashback Nightmare). The ending credits for the anime also ends with Tohru, Kanna, Elma, and Lucoa going to sleep (notably, none of their pajamas match up with what they wear in series). Happens at the Grand Finale of the Mitsuboshi Colors anime. During the final skit in the episode (after the credits roll), the gang brings a futon and set it in the middle of the park in order to relax and do surveillance. In the end though, they end up falling asleep. Mysteria Friends The second part of episode 4 ends with Anne going to bed. The New Game! OVA ends this way with the gang sleeping in separate futons in the same room during their company trip. The last scene of episode 39 of Maho Girls PreCure has Mari, Rico, and Kotoha all asleep with all of them holding hands while doing so. When Ruru makes herself part of Hana's family in episode 13 of Hugtto! Pretty Cure, she and Hana turn in at the end and end up sharing the same bed. This happens again at the end of episode 34, this time involving Hana and her sister Kotori. All the horse girls lie down and rest after doing all the random fun activities during the ending credits of Uma Musume. Alien ends with Ellen Ripley as the Sole Survivor of the Nostromo, recording her last mission log before going into hibernation. Aliens ends with Ripley again preparing to go into hibernation after escaping from the alien-infested planet with the other survivors. After the family rescues Beethoven, the folks say goodnight to each other and go to sleep in their bedroom... filled with a bunch of other dogs they managed to rescue as well. Wild Strawberries ends with Isak falling asleep, feeling at peace with himself after reconciling with his past and making several attempts to be kinder to those around him. Dinosaur Vs: "Dinosaur vs. Bedtime" ends with Dinosaur falling asleep. At the end of Goodnight Darth Vader, Darth Vader has fallen asleep reading, then shortly after, Luke and Leia fall asleep. Roger Zelazny's "Great Slow Kings" end with the main characters going to sleep. One of the Hairy Mc Clairy books ends with Hairy going home to bed. In the Im Not series, both "I'm Not Cute" and "I'm Not Sleepy" end with Baby Owl going to bed. With a few exeptions, most books in the Madeline series end with the twelve little girls going to bed and Miss Clavel turning off the lights and closing the door. Narrator: And that's all there is. There isn't anymore. The Mog book "Mog on Fox Night" ends with the three foxes asleep under the snow. The Old Nurses Stocking Basket: The story "The Sea Baby" ends with Mary Matilda falling asleep. One Fish Two Fish Red Fish Blue Fish ends with the kids falling asleep with their unusual pet and narrating, "And now, goodnight. It's time to sleep, so we will sleep with our pet zeep. Today is gone, today was fun; tomorrow is another one. Every day, from here to there, funny things are everywhere." The Park In The Dark ends with Loopy, Gee, and the monkey going back to bed. Happens at the end of every single episode of The Big Comfy Couch. Who could blame Loonette? Those 10-second tidies must really take it out of her. In one episode of The Honeymooners, Ralph and Norton end up falling asleep while watching late night TV. In the deleted scene of the Grand Finale of How I Met Your Mother, Lily pays Marshall up in bed as they both bet that whether Ted and Robin would get back together or not, all the while Marshall singing as each bill is passed from Lily even though they have joint accounts. The scene ends with them declaring their love at the bedside before turning off the lights. The Star Trek: The Next Generation episode "Night Terrors" focuses on everyone except Data (an android) and Troi (a Half-Human Hybrid where the other half is a species that sleeps a bit differently than humans) not being able to get REM sleep. When the day is saved, Data orders Captain Picard to bed so that he can catch up on REM sleep. "Dark Frontier" ends with Seven of Nine being tucked into her regeneration alcove by Captain Janeway. Inverted with "Waking Moments" when ends with the crew being unable to get to sleep at all. The Monster of the Week involved an alien that put them to sleep and attacked them with bad dreams. The Suite Life of Zack and Cody: After finally succeeding at curing London of her insomnia, Mr. Moseby, Maddie, and Esteban all end up falling asleep on London's bed. At the end of the Barney and the Backyard Gang video "Waiting for Santa", Barney, Michael, and Amy return home from Santa's workshop and find Santa hasn't arrived yet. Barney gets partway through reading "The Night Before Christmas" before they all fall asleep. Santa slips in and out of the living room unnoticed; to the audience, he whispers "Merry Christmas to all, and all a good night. Zoey 101: After finally getting help from Mr. Bender at the end of the episode, "Little Beach Party," Zoey and the gang fall asleep in the back of Mr. Bender's pick-up truck. Happens quite a bit on Sesame Street when the episode ends during the night or there's a sleepover. There's a recording of the theme song being played on a celestia that's usually used here. The Puzzle Place Happens at the end of the sleepover episode. The kids even say goodnight to the audience before dosing off. Iconoclasts ends with Robin taking a well deserved nap after fighting the physical manifestation of God. This is how Kirby Super Star's "Milky Way Wishes" ends; with Kirby going back home to take a well-deserved nap after saving the world and preventing the Sun and Moon from fighting. A lot of Game Over screens in Kirby games have the titular character appear sleeping; always having the hand you use to make your choice with wake him up and run back every time you choose "Continue." However, in a couple of games when you choose "End," the hand gently picks up Kirby, lays him on either the moon or a large star, puts a blanket on him and leaves him to sleep. Inverted in Bugs Bunny in Double Trouble, as the game actually begins with Bugs sleeping and ending with him waking up. It is a reference to the ending of the short Water, water every hare which inspired one of the levels and the main plot of the game (and which however also had everything turn out to be real). In essence, the game is about Bugs dreaming about his previous cartoons with a few changes here and there. Similarly but with a much darker inversion Porky Pig's Haunted Holiday has Porky planning his vacation (without suspecting the haunted aspect of it) while in bed and then falling asleep and encountering all manners of bizarre and horrific creatures that have plagued his journeys and cartoons. After finishing the game, Porky seems to be able to continue his sleep peacefully this time...but then several eyes start staring at him in the dead of the night making clear that the nightmares are real and leading him to wake up for good and flee for his life. In My Bedtime, a game based on Daniel Tiger's Neighborhood, the game ends with Daniel asleep. 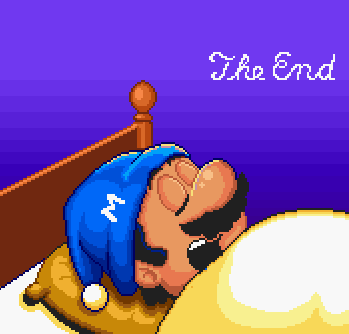 The ending credits scene of Super Mario Bros. 2 where the whole game was all Mario's dream. Wonder Boy III: The Dragon's Trap ends with the hero, now back to Hu-man form, going home to sleep. Dragon Tales: At the end of "It Happened One Nightmare", after Max, Emmy, Zak, Weezie, and Cassie help Ord overcome his fear of sleeping due to a nightmare he had before, he falls asleep in the field where they all were... and the others follow suit. It's the only episode which doesn't end with Max and Emmy (and later Enrique) returning to Max and Emmy's playroom. At the end of the sleepover episode, Max falls asleep on a chair in the playroom and Emmy covers him with a blanket. Every episode of Little Bill ends with the titular character briefly revisiting the events of the episode before a family member cuts across him with "Little Bill, who are you talking to?" At this, Little Bill giggles a bit, then rolls over and goes to sleep. "I Don't Want to Go to Bed" ends with Princess going upstairs to bed because she didn't get enough sleep the night before. "I Don't Know What to Be" ends with the Princess falling asleep and, oddly enough, replying, "Meow" when the narrator tells her goodnight. Every episode of The Magic Roundabout ends with Dylan saying, "I wish it was time for bed" and falling asleep. At the end of "Too Many Pinkie Pies", the Mane Six ask what Pinkie Pie wants to do after the whole duplicating mess. Pinkie Pie decides right then and there to just lay down and go to sleep. The others then quietly leave. At the end of "What Lies Beneath", the young six, having apparently been awake all night and having faced their greatest fears in that night, all fall asleep together on the floor of the library. The Powerpuff Girls do this twice even though at the end, it is technically morning and they should really be starting the day. The first was Boogie Frights and the second was Dream Scheme. Rankin Bass Jack Frost: Pardon-Me Pete saw his shadow at the beginning of the special. So after he tells us the whole story, it is time for him to get his six more weeks of shut-eye. Happens Once per Episode in Ruff Ruff, Tweet, and Dave, where each episode ends with the titular characters go back home and go to sleep. Rugrats: The episode "No Naps" ends with all the kids asleep on the floor. The first three episodes of Thomas the Tank Engine that focus on Trevor the Traction Engine, "Saved from Scrap", "Thomas and Trevor/A New Friend For Thomas", and "Edward, Trevor, and the Really Useful Party" all end with Trevor falling asleep in his shed after a hard day's work.